Today, a new 3rd party launcher called Action Launcher is making the rounds. It’s from the creator of Tweet Lanes, one of the more popular Twitter apps available. This new launcher runs $4 in Google Play, a price similar to Nova Prime or Apex, only it has about a tenth of the features. Now, that may not be a bad thing for those looking to dive into an ultra minimal and fast launcher. Let’s talk about it. Action Launcher’s main selling point, is the removal of the classic app drawer button and the inclusion of a new app panel on the left side of your first home screen. The developer decided that the traditional app drawer was too slow and set out to find a way to make accessing your apps even faster. 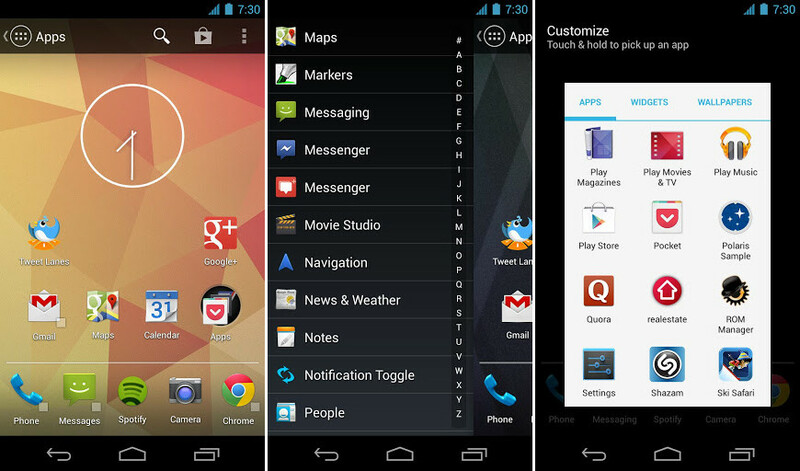 With this left panel, a quick swipe accesses your list of apps which has been alphabetized. You can quickly jump to a specific letter and then access the app you desire. As you’ll see in the video, it is indeed a fairly fast way at choosing an app. From there, the developer introduces a new style of folder called a “Cover.” A cover is way for you to create a folder that acts as both a single action or holds a number of apps or actions. For example, you could have your Chrome icon open Chrome with a single tap or open as a folder with bookmarks to your favorite sites thanks to a double-tap. Other than that, the launcher doesn’t have much else to offer. There is no icon support or many of the other tools you have grown accustomed to in some of the more established launchers. If you are looking for something new and a bit out of the ordinary, then feel free to give it a shot.